I had the good fortune of serving as a K-9 officer for a federal agency for five years, as well as with a civilian agency, and came to appreciate the courage, loyalty, and dedication the canines play in our professional lives. I served in the Army in combat in Vietnam in ground reconnaissance and air crew rescue, and was wounded a few times. I turned to writing because paper cuts feel a whole lot better than bullet holes, :), and have enjoyed some minor success with my book, Acceptable Loss, that went on to become an International best seller. In addition, I wrote MIA Rescue, LRRP Company Command, Stalking the Dragon, Clubs are Trumps- The Road from Plum Run, The Next Mirage, and others. Do Bomb Dogs Dream of Chasing Butterflies is my latest effort and, perhaps, my way to thank and applaud those who serve in working K-9 teams. Hopefully, this new book does that too with some insight, compassion, and humor. If you like humor, military fiction, and dogs, Do Bomb Dogs Dream of Chasing Butterflies? by Kregg P. J. Jorgenson is for you. Written in tribute to the service of military working dogs and their handlers, and told by a talented and witty Belgian Malinois named Thor, it provides a view from the bottom up of battlefield conditions faced in modern warfare. This “bottom” is Thor and his U.S. Army handler and partner, Max. Together, they search for weapons stashes and IEDs (Improvised Explosive Devices), with the hope of depriving the enemy of assets they would use against us and keeping our troops alive. In the process, Jorgenson describes what it is like operating in these environments, with IEDs hidden along routes of travel, booby-trapped buildings, suicide bombers, and supposedly friendly people who turn out not to be all that friendly after all. I’ve always felt that a good work of fiction can let you laugh, sit on the edge of your seat, cry, and still feel good at the end. Do Bomb Dogs Dream of Chasing Butterflies? did that for me, and more. Jorgenson’s narrative is descriptive, flowing, well-paced, and balanced between the humorous and the serious. Thor’s attitudes and observations about life, especially about the people and cats he’s encountered, kept me chuckling. I’d love to meet that dog, and I’d love to meet Max. If I were in combat, I sure would want their team, or one like them, on my side. I highly recommend this book. But, a warning: you’ll laugh, you’ll sit on the edge of your seat, and you’ll cry. In the end, I think you’ll feel good. Semper Fido! 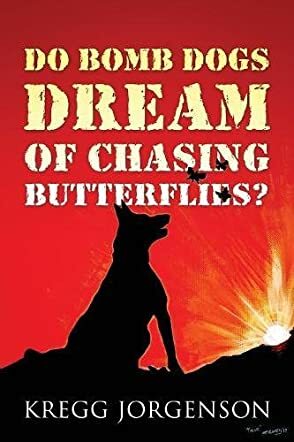 Do Bomb Dogs Dream of Chasing Butterflies is an intriguing book from Kregg P.J. Jorgenson. The story is told by Thor, a Belgian Malinois, a remarkably well-educated dog inclined to quote Shakespeare, usually disagreeing with The Bard. Thor tells of his relationship with his young, newly-qualified handler, Max Ritchie, and their two postings to war-torn Iraq, and what happened when they were too close to explosive devices that detonated. The break-up of Max’s affair with a girl Thor calls his “prissy poodle girlfriend” causes Max to accept a tour of duty with the “Devil Dogs” in Afghanistan, where Saddam Hussein and his perverted, violent son, Uday Hussein, rule. Will Thor survive? If he does, what will happen to “government property” when he can no longer work? Thor is a dog most readers will recognise, barking at a goat and a goatherd, and seeing cats as potential prey. Kregg P.J. Jorgenson has chosen a marvellous way to draw in more readers to this cross-genre tale of recent military history. The story is fast-paced and the action vivid. The description of the effect of an explosion generating a thousand degrees of heat is horrendous and amazing. The fact that a second explosion can be detonated by a cell phone whilst the injured are being rescued is both terrifying and horrifying. Thor’s dream is more likely “cry havoc and let loose the dogs of war,” though, being a dog with a sense of humour, he disagrees. Love it or hate it, Do Bomb Dogs Dream of Chasing Butterflies is a five-star book readers won’t put down. Do Bomb Dogs Dream of Chasing Butterflies? written by Kregg P. J. Jorgenson is a story of war, dedication and honor. It is a story of peril and of promise for the combat K-9 team of Thor, a Belgian Malinois, and his handler, Sergeant Max Ritchie. Max and Thor are one of the best K-9 teams in the military - real “Top Dogs.” Their job is to sniff out IED’s. Missions are dangerous and often have deadly outcomes. “It’s all fun and games until it isn’t.” After all, war is hell! They endure two deployments in Iraq and, after a brief time of rest and recovery stateside, they volunteer for a third deployment to Afghanistan. In Afghanistan, things get really interesting when a new veterinarian arrives at Camp Phoenix. Thor senses an immediate attraction between Max and Captain Larson, “Dr. Deb.” As the deployment approaches its end, plans for the future are considered. However, all thoughts and upcoming plans are put on hold when the elite K-9 team is requested for another special mission. Hopefully, this one will be the last. Do Bomb Dogs Dream of Chasing Butterflies? portrays the unique bond between a dog and his handler. Kregg P. J. Jorgenson writes an unusual wartime tale, or could it be “tail?” The narrative is told from the point of view of the K-9 bomb dog. It is full of sensory descriptions, canine banter and humor, and rich in doggie metaphors. Jorgenson pens many insightful and unforgettable lines. The difference between cats and dogs described by the K-9 protagonist is hilarious. Jorgenson uses literary quotes from Shakespeare and Sherlock Holmes to give his story depth and comedic forethought. The narrative also includes historical information regarding the war zone locations, but stays focused on the plot, maintaining the only commonality between Iraq and Afghanistan is the use of IED’s. Do Bomb Dogs Dream of Chasing Butterflies? is a one-of-a-kind war story. It reveals the duty and dedication of military bomb dog teams. The narrative ends well, but is not free from pain or heartache, proving that not all is fair in love and war. There is so much fun in this book. It is a rollicking ride through war zones and what it takes to survive, a story told by a dog and with a very humorous and unique take on humans. The plot moves pretty fast and it has many surprises for readers. One can hardly guess what will come next, being pulled into the thrilling narrative and experiencing sudden jolts of pleasure as the surprises come in loads. The characters are interesting and I could relate to the dogs, enjoy the awesome humor, and care so much about them. Do Bomb Dogs Dream of Chasing Butterflies is well-written and Kregg P.J. Jorgenson combines his gift for storytelling with excellent prose to paint delightful images in the minds of readers. I enjoyed the cultural commentaries that feature dialects and offer readers powerful insights into the setting. This book is a great success, a well-imagined plot that is masterfully executed, a story I’d love to watch on screen. Do Bomb Dogs Dream of Chasing Butterflies by Kregg P.J. Jorgenson is a cleverly written story. It begins with the introduction of the K-9 team of Max and Thor. A dedicated team of experts in bomb detection and removal. This story is told by Thor, the Belgian Malinois; a breed of dog very similar to German Shepherds. In Thor's own words, they are the ones deployed for police work, and are experts at performing flying tackles on bad guys. Thor and Max get the call whenever there is a possible IED threat. IED is the term for Improvised Exploding Device, or more commonly known as a home made bomb. It's Thor's job to sniff it out and Max's to disarm and remove it. They boast a winning record and are still alive to tell the stories with the scars to prove it. Thor gives a great shout out to the doctors, nurses and veterinarians for all that they do. Whether it is in small towns or the larger cities of the Middle East, Thor gives his version of the good, the bad and the ugly with tongue in cheek humor and just enough sarcasm thrown in for extra effect. Mr. Jorgenson does a magnificent job of describing in detail the procedures, call signs, and military lingo that helps you feel like you are right there with them as they go through their missions. Successful ones, as well as the ones where they couldn't get out of range quick enough. The realities of war, plain and simple. I was attracted to the author's flawless style of writing, especially having served for seven years. He paid close attention to detail while delivering a great story in a way so that I felt like I was a part of it. Using Thor's opinions, assessments, and brutally honest, sarcastic comments was just pure genius. Do Bomb Dogs Dream of Chasing Butterflies is a great read for anyone, but also really pays tribute to our soldiers, vets, and dedicated medical staff. I loved this book. Bravo! Semper Fido! Do Bomb Dogs Dream of Chasing Butterflies? by Kregg P. Jorgenson is the story of a dog on duty and how he perceives the world. Right from the beginning, I felt like I was reading the script of a movie. I have a soft corner in my heart for dogs and this novel hit me right in the feels. The story follows the life of Thor, a mighty Belgian Malinois veteran K9, and his partner, Max. They fight the odds and stay together through thick and thin. He may be a bomb sniffing dog who is trained to be alert and on the lookout for danger, but he is still a dog who loves his partner. Through getting stuck in dangerous situations in Taliban-ridden areas to simply being together under the big sky, Thor cherishes the time he gets to spend with Max. They are partners who would do anything for each other without any hesitation. Together, they fight danger, they play, they laugh and they take care of each other like a family does. Heartwarming and heartbreaking as well, the story takes you places you never thought were possible. The story is written from the perspective of Thor and made me adore this novel. I loved the premise of the story because it showed the bond between Max and Thor and how natural it was. The dedication they shared, the bond they had created and how they protected each other had me in tears at some points. I loved the unique narrative style and, honestly, if I have to imagine how a K9 thinks, I am pretty sure he would be just as awesome as Thor was. Truly amazing and simply fantastic!